Explanation: Sometimes a morning sky can be a combination of serene and surreal. 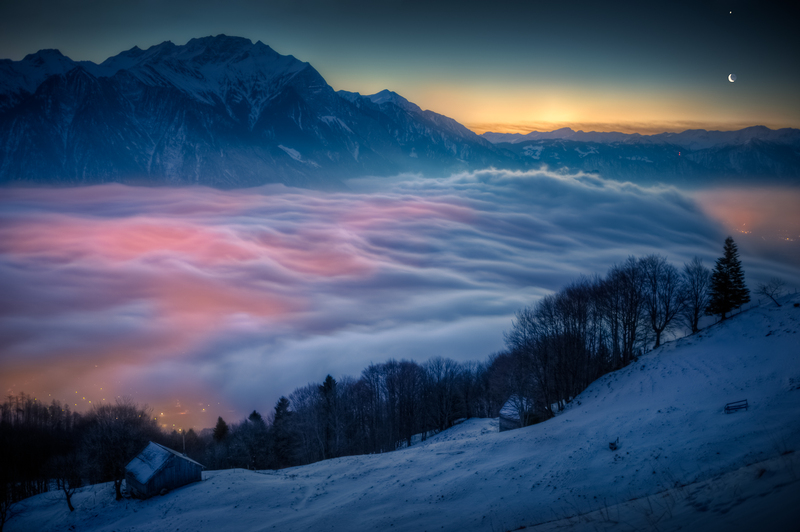 Such a sky perhaps existed before sunrise this past Sunday as viewed from a snowy slope in eastern Switzerland. Quiet clouds blanket the above scene, lit from beneath by lights from the village of Trübbach. A snow covered mountain, Mittlerspitz, poses dramatically on the upper left, hovering over the small town of Balzers, Liechtenstein far below. Peaks from the Alps can be seen across the far right, just below the freshly rising Sun. Visible on the upper right are the crescent Moon and the bright planet Venus. Venus will remain in the morning sky all month, although it will likely not be found in such a photogenic setting. Poll: Which of last week's APODs should be the APOW?